NATURAL COTTON ROPE IS SOFT TO THE TOUCH, EASY TO TIE KNOTS IN AND SPLICE. Commonly used to create rope baskets or bowls, as a tent-line rope, hammock rope, halter and lead rope, harness rope, crab trap rope, awning rope or decorative rope. Cotton is the softest of all fibers, which makes it ideal for when rope abrasion is a significant factor. Because it is so soft it is perfect for decorative work and handrails. SOLID COLOR CONSTRUCTION - West Coast Paracord's Cotton Rope has a core that is the exact same color as the outside. It's unfortunately very easy to find rope that has a colored shell with a grey and multi-colored core, but at West Coast Paracord, our natural rope has a solid colored core that means it truly is 100% cotton - to the core! Stop worrying about these yarns popping out during use! CREATE FUN JEWELRY AND CRAFT PROJECTS WITH THIS EASY-TO-WORK-WITH COTTON ROPE. 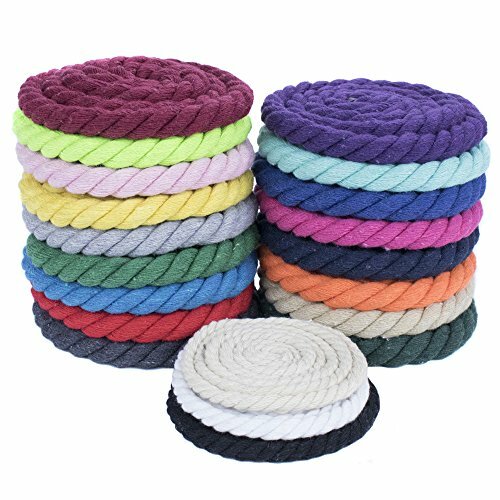 Our high-quality twisted cotton rope can be used as cording, perfect for stringing beautiful jewelry and accessories. It is also excellent for handmade projects and macramé. Our wide variety of colors are suitable for a number of decorative uses; wedding ceremonies, rustic wedding decor, events, interior design. OUR TWISTED COTTON ROPE BY THE FOOT IS CUT TO LENGTH AND PACKAGED IN 25 FEET, 50 FEET, 100 FEET VARIATIONS. We currently offer these lengths in multiple colors in 1/4 inch diameter. Our cotton rope is true to diameter while on the spools in our shop. However, when the rope is cut to length it's possible that the fibers may expand. It's not uncommon for the ropes to increase almost a whole size in diameter.